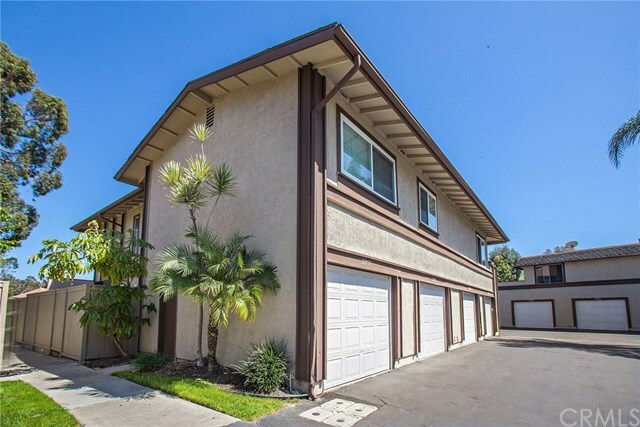 Don't miss this gorgeous, town home in Mission Viejo! The first level of this amazing home features an open floor plan with a large family room, a spacious kitchen with lots of cabinet space and a utility room. The separate dining area has large sliding glass doors that open up out to the sunny patio! Perfect for entertaining family and friends! This home features scraped ceilings, recessed lighting, & laminated wood flooring throughout. Go to the second level and the large master bedroom is quiet and private and features a spacious, walk-in closet. There is a direct access, one-car garage with laundry hook-ups & storage, plus an assigned parking space, and plenty of guest parking in the neighborhood! Residents of this lovely community enjoy numerous green belts, a sparkling pool, spa & a children's playground. The community is close to the Aliso Creek Trail & award-winning schools, amazing restaurants, local shops & easy access to the freeways. Ownership comes complete with membership to Lake Mission Viejo, offering many activities throughout the year that include boating, fishing, summer camps/classes & concerts. Directions: Trabucco to Via Nuez - take first left after turning onto Via Nuez and park in guest parking. Home is on the on the left.